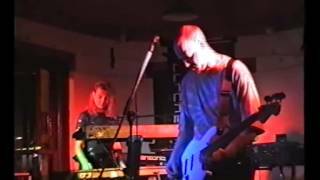 The good folks over at Brisbane's Trans:Com have kindly uploaded to Youtube a very early Tycho gig - at the Orient Hotel, 7th July 1995...that's right, over 17 years ago! This was our third ever gig, in our early 2 piece incarnation, only 12 weeks after our live debut, and more than 18 months before Stephen Birt joined us on drums. These were scary times - equipment was mostly very cheap and/or somewhat unreliable, and samplers had to be loaded from floppy discs (remember those?) between songs. A classic early Tycho set, including stuff like "Marianne", "Seventeen", and "Sentence"...the occasion being the launch of the Joy Division "best of" CD, Permanent. Hence the inclusion, for the first time, of our Joy Division cover, "Atmosphere".